Joshua Fishbein, composer of the 2010 Youth Inspiring Youth winning composition Unseen Secrets, recently added to his long list of awards the 2011 – 2012 Guild of Temple Musicians Young Composers Award. His composition, Two Prayers for the Sabbath Evening: V’shamru and Oseh Shalom, is scored for cantor, four-part chorus, and piano. He’s also the recipient of the 2011 American Choral Directors Association (ACDA) Raymond W. Brock Memorial Student Composition Contest. Oseh Shalom was premiered at the Western ACDA conference in Reno on March 1, 2012. The entire work will premiere this June at the American Conference of Cantors/Guild of Temple Musicians Annual Convention in Portland, Oregon. Josh began college at Carnegie Mellon University as a psychology major with a minor in music composition, intending to become a music psychologist. The required music classes for the music minor left him hungry for more, so in the end he graduated with degrees in both subjects. Along the way he decided he preferred writing music and hearing it performed to doing research and writing journal articles, a lucky decision for those of us privileged to sing his music. Also a singer, Josh was employed while still a high school student to sing with Cantor Avi Albrecht in the Men’s Choir at Beth Tfiloh Congregation of Baltimore. He has since sung baritone with professional choral ensembles Volti, the Artists’ Vocal Ensemble, and the Grace Cathedral Choir of Men and Boys. Asked whether singing or composing is his first love, he says, “Definitely singing! But composing is a close second.” A love of music starts early, but Josh says “the music from my childhood is a bit fuzzy in my memory. I remember singing in my synagogue choir and I remember hearing my father improvise on the piano while I fell asleep.” His father didn’t get far in piano lessons, so he usually only played the white notes. 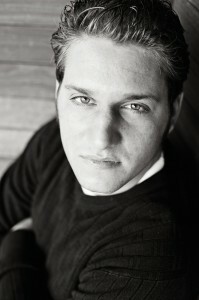 Josh earned his Master of Music Degree in Composition at the San Francisco Conservatory of Music. A native of Baltimore, Maryland, he now lives in Los Angeles with his wife, Marina, while working on a PhD in Music Composition at UCLA. He’s also setting excerpts from William Blake’s Songs of Innocence and Experience for the Hollywood Master Chorale as part of their “Voices of LA” project, a new two-year commissioning program funded by the LA County Arts Commission. In his rare spare time, Josh enjoys movies, walks near the water in Santa Monica, and serving as sous-chef to Marina, whose specialty is Russian food. WomenSing is proud to include Unseen Secrets on its next CD, Songs of the New and Old World, to be released in the late fall of 2012.